The main opposition Liberty Korea Party has come under fire for its recommendations earlier this week for a committee charged with investigating the 1980 Gwangju Democratization Movement, infuriating families of victims as well as the general public for suggesting far-right figures. The launch of the committee, initially slated for September, has been pushed back with the opposition party delaying its recommendations, seeking to avoid alienating its supporters. Families of the victims of the brutal military crackdown and political parties lambasted the party for recommending three individuals whose views on the historically significant pro-democracy movement are widely deemed offensive. 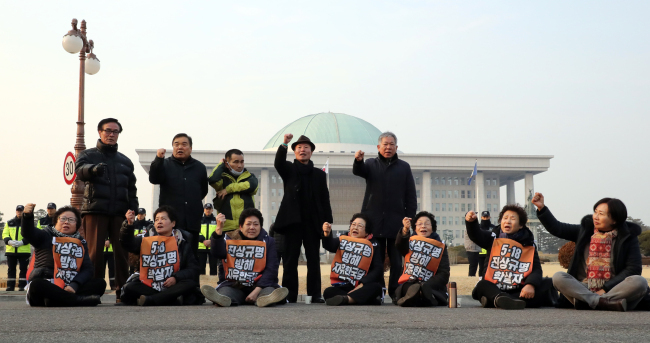 Calling on the conservative party to “stop interfering with the formation of the fact-finding committee and to stop denigrating the Gwangju pro-democracy uprising,” seven members of a council representing those who lost family members in the Gwangju uprising began a sit-in protest in front of the National Assembly last Friday. The fact-finding committee, created under the Special Act on the May 18 Democratization Movement, is tasked with investigating human rights violations and the massacre that occurred during the Gwangju democratic uprising in 1980 under former President Chun Doo-hwan. Chun took office in a military coup in 1979. The formation of the nine-member committee will be finalized after a review by Cheong Wa Dae. It will consist of one person recommended by the National Assembly chairman, four by the ruling Democratic Party, three by the main opposition Liberty Korea Party and one by the minor opposition Bareunmirae Party. According to the special act, enacted last year, the committee’s two-year term can be extended by a year. The main opposition party first came under fire for shortlisting the extreme right-winger Jee Man-won, who maintains that North Korean soldiers led the “riots” in Gwangju. 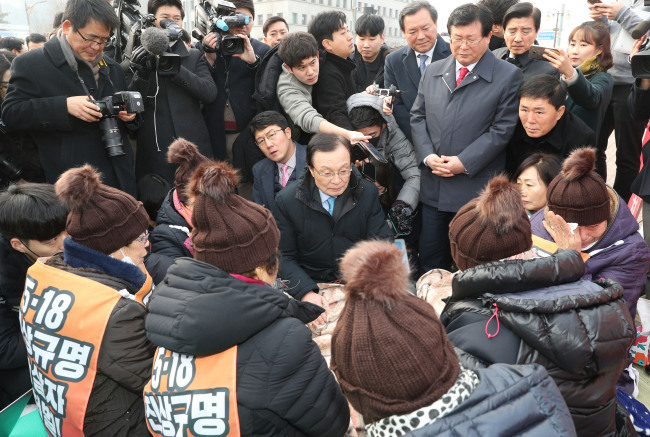 Jee and his supporters held a protest in front of party floor leader Na Kyung-won’s residence last week, using abusive language in response to calls within the party to exclude Jee from the running. The Liberty Korea Party ultimately did not recommend Jee for the committee, but found itself in a second whirlwind of controversy this week upon recommending Kwon Tae-oh, former chief of the Combined Forces Command’s special operation team; Lee Dong-wook, a former reporter at the Monthly Chosun magazine; and Cha Ki-hwan, a former Suwon District Court judge. In 2012, Cha retweeted an article that said North Korean soldiers were sent to the South during the Gwangju uprising. In 2017, he was charged with abuse of authority for allegedly interfering with a special committee looking into the 2014 Sewol ferry disaster. In another article, titled “10 misreports and exaggerations about the Gwangju incident,” Lee argued that reports that martial law troops had targeted citizens with tanks and gunfire were exaggerated. Kwon served as the chief of the special operations team within the Combined Forces Command. “The party believes they are well qualified to conduct an objective investigation into the distorted and concealed truth about the May democracy movement,” the Liberty Korea Party said in a statement. “If Liberty Korea Party is not willing to fulfill its duty to history, it should withdraw recommending members,” they added. Lee stressed that LKP should establish a guideline to prevent members from disrupting the fact-finding committee.